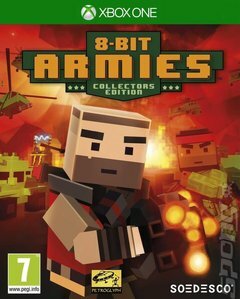 As its name kind of hints, 8-Bit Armies digs back into gaming's history to provide you with a real time strategy experience that you might call classic, retro or both. That classic/retro vibe is certainly helped by the fact that a chunk of developer Petroglyph's team hails from Westwood Studios, which arguably got the RTS genre moving way back in 1995 with the legendary Command &amp; Conquer series. The studio provides a back to basics approach. It doesn't care about building queues. It doesn't mess about with upgradeable buildings or population caps. Throw up a few key buildings, hit your unit creation buttons as quickly as you can and direct them well into some explosive combat. It's all about speed, baby! The aesthetics certainly support this old school approach, albeit in a much slicker way than the consoles of old could have hoped for. 8-Bit Armies goes for a blocky, Minecraft-style aesthetic that makes sure you know you're here to have fun. There are two campaigns boasting a total of 40 single-player campaigns, plus 12 co-op missions against a variety of AI opponents and a dozen multiplayer skirmish maps to boot. That's plenty of explosions to be started!